Here's something I hear a lot: looking inside Sites and Site Collections you didn’t create can be a huge pain to understand and manage! Especially when Site Columns and Site Content Types are created everywhere, with different names, no description and without any classification. Everything goes in the “Custom Site Columns” group or “Custom Content Types” group. I’ve seen companies using more than 50 Site Columns because of their needs in classification and taxonomy. It can be very hard to manage them when it’s wildly created. 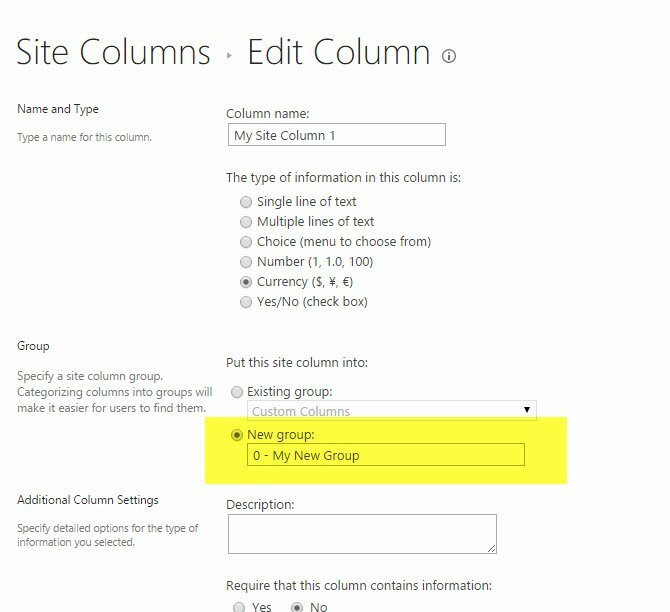 Creating a Site Column or a Content Type is almost too easy to do... So be careful when you create them! Make sure you put them into a specific group that has a real, specific meaning. Next, add a description. It'll help in the long run, trust me. And finally, if you specify them as required columns, I recommend to add a default value. I like to group my Columns and Content Types by purpose. A good example would be a “Conference Calendar” group. Adding a description is very important so that other users can understand why the Column or Content Type exists. How to reorganize your site columns or your content types? Let’s say you have new responsibilities, and want to clean up the Site Columns found on your multiple Sites. You’ve got 2 choices: The SharePoint way or the Sharegate way. Here’s the description of how it's done following each way. And, of course, I can't stress this enough: don’t forget to add a description. Set a group and apply the changes! 1. 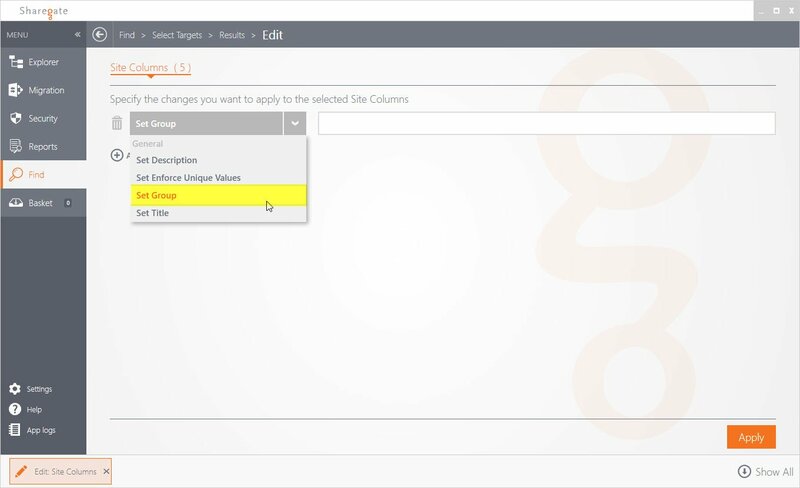 From the Find feature, select the "Site Column" object and specify desired filters. For example, the Groups that contain the word “Custom”, so you’ll find all the ungrouped custom Site Columns. You can also add the Group column to see in the results. Click on Next. 2. Select the target (you can select one or multiple sites). This is the power of the tool! 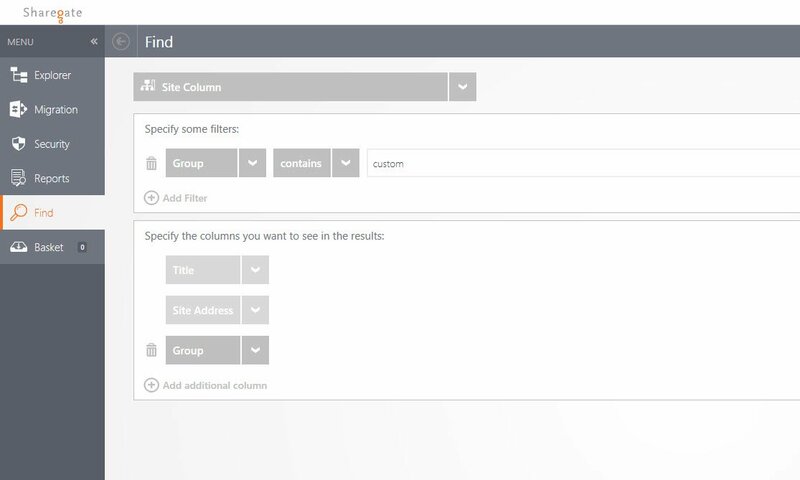 Select the Site Columns you want to regroup, then click Edit. 3. Then, select the “Set Group” action and write down the Group you want to apply to the selected Columns. You can type the name of an existing group or create a new one. Click Apply, and in a few seconds, changes will have been applied!!! Isn’t this great?! If you don’t believe how much time you can save using Sharegate, here’s the run through recording of both methods! The gain is incredible! It took less than half the time with Sharegate! Change the group or add them to a new one. Note that you can select hidden Content Types and put them in a Group so you’ll be able to see them. Be careful with hidden objects in SharePoint, it’s not recommended to change them. If they are hidden, it’s for a good reason. How to manage Site Columns and Content Types? I’ve said that it’s important to add a description to your Columns and Content Types. You can do it directly from Sharegate. The scenario is the same, directly from the Edit menu after your query using the Set Description transformation. But when I need to edit objects one by one, I prefer to use the Explorer. The Explorer allows me to drill down to the place or object I want to see. When I select a Site Column, I can see all the information related on the right panel. This is so useful! This is precious information! You get the description, default value, the Column type, Group… if required … all the properties can be seen in a jiffy. The quick action button then allows me to Edit in Sharegate or directly configure in the UI. This is how I use Sharegate: I use the “Find” or “Reports” to see or edit multiple objects. And when I want to get the big picture of my environment and edit one object particularly, I prefer using the explorer. 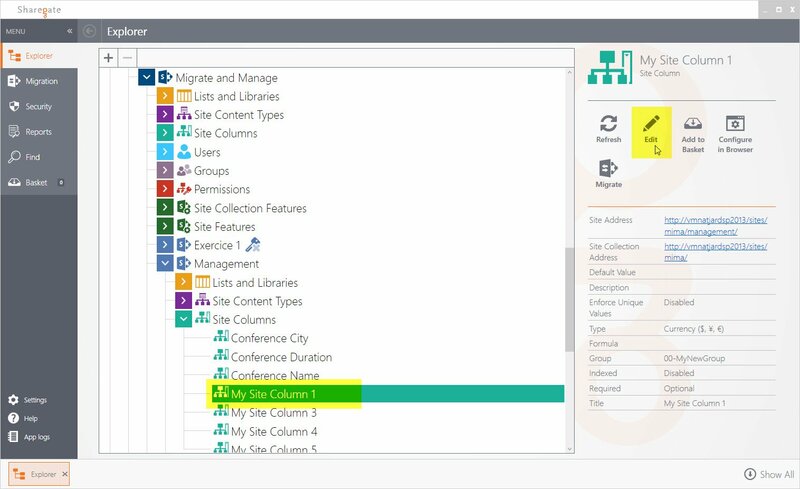 No more excuses not to manage SharePoint! 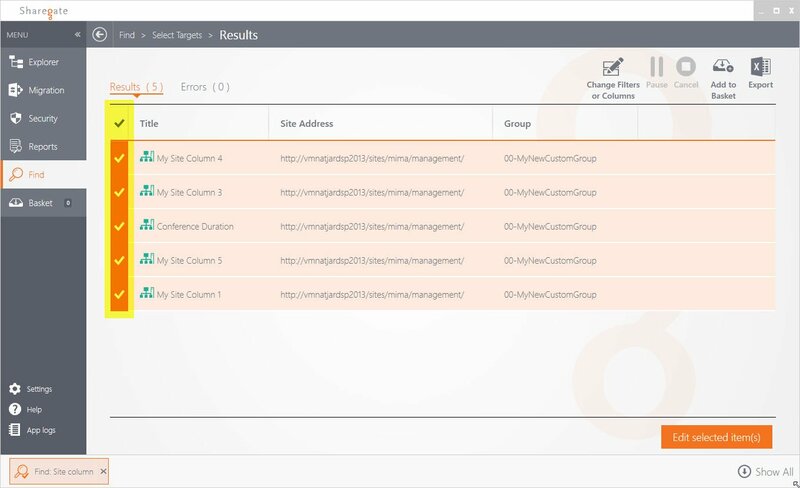 And you, how organized are your Sites, Sites Columns, Site Content Types and Lists Content Types?